What is minimum base unit/ cabinet size when purchasing a kitchen sinks? The stated minimum base unit size (typically 450, 500, 600, 800 or 1000mm) refers to the standard kitchen base unit size required to fit the product. 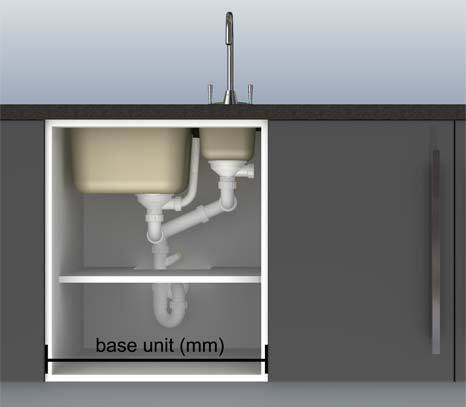 The entire sink may not fit within the stated base unit, the stated size refers to the minimum sized base unit required to fit the sink bowl(s), overflow, waste pipework & mixer tap. These sizes are more important when fitting a sink adjacent to appliances or on a terminating unit. How do I install an undermounted sink? Can I fit the sink myself?